Already posted a coupla notes. My name is Doc. Older guy. Own a coupla HD's . Have always kept a a ricer in the garage for work as I ride every day to work hail, rain or sun. bits and pieces with what makes Bandits tick. Welcome to the forum Doc. Welcome Doc, there's at least one other member not too far from you. Welcome doc. I had a mate that went from a bandit to a tl1000, zx14 and then a Harley Davidson. I think he regrets selling the bandit. How do you like the Bandit over the hd tractor? Welcome Doc, I graduated from a Dynaglide FXDC to a Bandit, love the handling and get up and go, hate chain adjustment and oiling. Still, better on a Bandit! This is why this is the best forum! You just mention an issue and someone solves the problem. Thanks Reddog, one oiler to be ordered and fitted. Came with the Scorpian slip on and a 45L Givi top box. 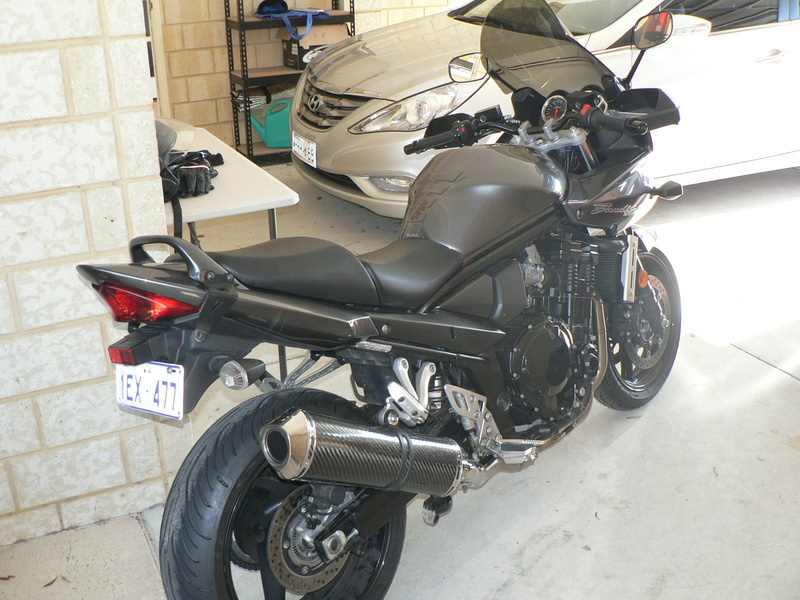 Bargin at $6K with 4700 Km's on clock. Fitted low touring bars, ZG touring screen, bark busters, Arrow headers, pair and O2 removal and resistor modes and wired in head light relays for a set of 80W head light bulbs. No problems doing night shift now. Just fitted Michlin Pilot Road 4's as the stock Dunlops were shot at 9000K. Still love my Harley's for the grin factor and enjoyable cruising ride , but the Bandit will be a great work hack for the next 4 or 5 years. Will do a ECU piggy back when wife stops bitchin about the $$ going out the door. I still don't get the attraction to HD but luckily there's a bike or 2 or 10 for everyone.. Welcome Doc - my wife is from Mandurah.